Alcohol goes directly to the bloodstream and avoids the normal digestive process. Drinking alcohol causes the red blood cells to cluster together and thicken. Capillaries, the tiny blood vessels that connect small veins and arteries, may break because of the pressure. This results in reddening of the eyes after drinking and may cause red, blotchy skin from heavy drinking. The term "drinker's nose" arises from the redness that affects the nose on heavy drinkers. Drinking alcohol in excess may encourage the development of pimples. 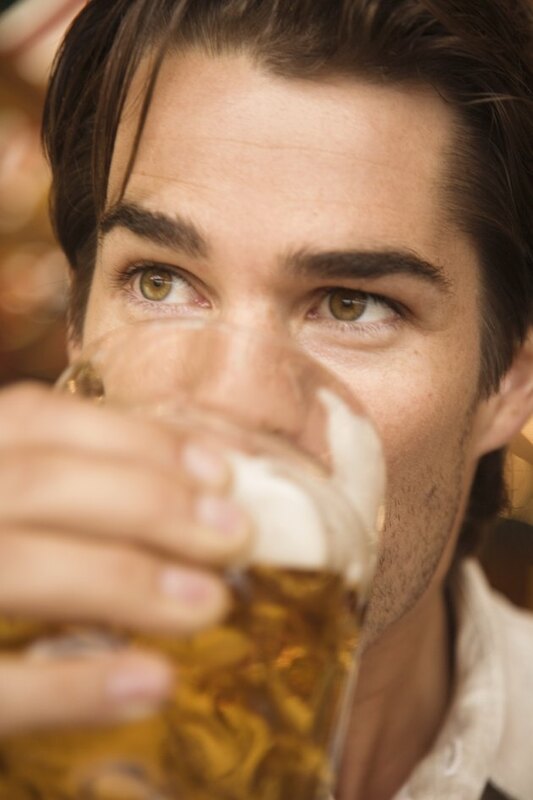 Even moderate drinking causes the blood vessels to dilate, but excessive drinking of alcohol may create chronic dilation of the capillaries, producing permanent flushing on the face. Moderate alcohol consumption is usually considered one or two drinks a day for men or one drink a day for women. If you drink more than that on a regular basis or frequently participate in binge drinking, five or more drinks a session, your excessive drinking may cause alcohol problems. Alcohol misuse can result in a variety of skin disorders because it interferes with immune functions to promote skin diseases, such as acne and psoriasis. Alcohol does not cause the skin disease rosacea, MayoClinic.com points out. However, excessive drinking worsens the condition, which can result in pimples, redness and flushing. Rosacea, a chronic inflammatory disorder, affects the skin on the nose, cheeks and forehead and pimples can result. Aside from alcohol, other factors that aggravate rosacea include hot foods and beverages, spicy foods, extreme temperature changes, hot baths, sunlight, stress and anger, strenuous exercise and medications that dilate blood vessels, such as drugs for blood pressure. Millions of Americans experience rosacea, which has no cure. Medication, laser therapy and other treatments, however, help the skin look better. Avoiding triggers of the disorder, which include drinking alcohol, also prevent outbreaks. Unfortunately, the red pimples that form, the blushing and the tiny broken blood vessels that become visible may be associated with heavy drinking to some people not informed about the disorder. Some people who have rosacea do not even know they have the disease. Rosacea often begins between the ages of 30 and 60, according to ConsumerAffairs.com. Still, alcohol abuse and alcoholism can cause pimples on the nose and face to break out either by worsening the condition of rosacea or because of the negative effects excessive drinking has on the skin. Broken blood vessels and pimples on the nose or face may indicate heavy drinking or even alcoholism if a person has not been diagnosed with a skin disorder. Alcohol's interference with blood vessels also leads to cell death and can affect cells in the brain, which can become damaged over time through excessive drinking. Only the problem drinker can determine if increased blood vessel breakage and skin damage results from too much drinking. Taking steps for help through support groups or a doctor can prevent further skin damage and avoid more serious health issues from excessive drinking.